The Theatre Royal Bury St. Edmunds stands at 5 Westgate Street on the edge of Bury St. Edmunds town centre in Suffolk. It is an example of a Georgian Theatre, built in 1819 by William Wilkins the younger, (1778  1839), who also designed and built Downing College, Cambridge, and the National Gallery in London. The Theatre opened on Monday the 11th of October 1819 with Colman's comedy 'John Bull' and a new farce 'A Roland for an Oliver'. 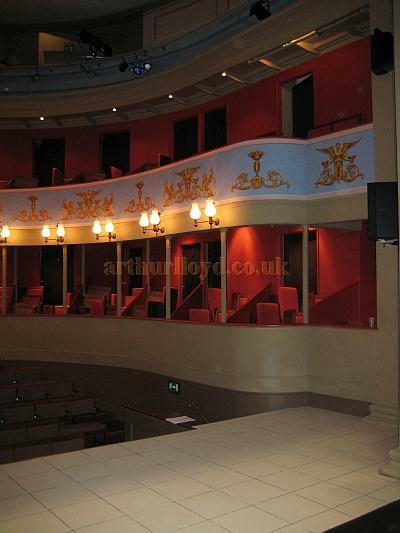 Right - The auditorium of the Theatre Royal, Bury St. Edmunds in 2009 - Courtesy David Garratt. The Theatre was part of 'the Norwich circuit' of Theatres, which toured productions between various Theatres in the circuit of Colchester, Cambridge, Ipswich, Bury St. Edmunds, Yarmouth and Norwich. William's father, also William Wilkins (senior), took overall control of this circuit when William was 21 years of age, and rebuilt or renovated all the Theatres in the circuit within a space of 15 years. Bury St. Edmunds Theatre Royal is the last remaining Theatre in this circuit apart from some parts of the Cambridge Barnwell or Festival Theatre, which is currently used as the Cambridge Buddhist Centre. Famous Actors to play the Theatre were Sims Reeves, a month before he made his London debut, and William Charles Macready, who appeared there in November 1828. He appeared as 'Virginius' on Monday, 'William Tell' on Wednesday and 'Macbeth' on Thursday plus 'Othello' for his benefit night on the Friday. The exterior of the Theatre is of yellow Woolpit brick with a classical facade onto Westgate street. It has a glazed Porte-Cochere and the Theatre is free standing. The Theatre is 133 feet long, by 70 feet wide. The Theatre has a very large stage in relation to its auditorium being approximately the same size. The first lighting was candle power, but in 1838 Gas lighting was introduced. Wilkins died in 1839 and the Theatre (as it was known) was taken over by William James Achilles Abington who promptly renamed the 'Theatre', to 'The Theatre Royal' (although the Theatre Royal does not actually hold a Royal Patent). Abington lasted one season only to be followed by T. D. Davenport, who had been manager of London's Olympic Theatre. The Theatre Royal is famous also as being the first Theatre to stage Brandon Thomas's 'Charley's Aunt', on 29th February 1892. 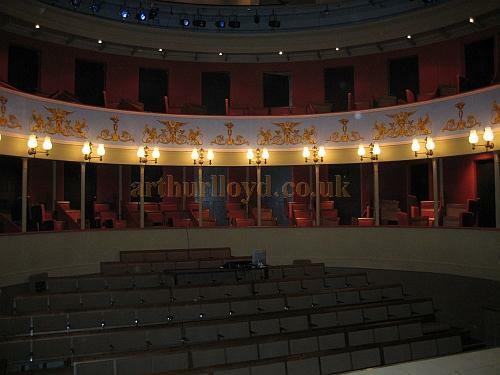 Left - The auditorium of the Theatre Royal, Bury St. Edmunds in 2009 - Courtesy David Garratt. Naturally the Theatre has a very long history. In 1906 it was altered by Bertie Crewe (Theatre Architect), for a period as a variety Theatre. One of the things Crewe did was to remove the Georgian forstage. In 1912 it was run by Florence Glossop-Harris, and by 1920 was in the ownership of Greene King & Sons, local brewers, who changed the Theatre's use to a barrel store. The Theatre was brought back to life for theatrical use in 1965, after a passionate campaign to restore it to theatrical use. In 1994 a single storey extension was built at the rear, and in 1995 improvements were made to the façade, and the forecourt lowered to its 1819 level with the foyer and auditorium ceiling redecorated. In 1966 the Theatre was restored by Ernest Scott as architect assisted by Ian Mackintosh as consultant. 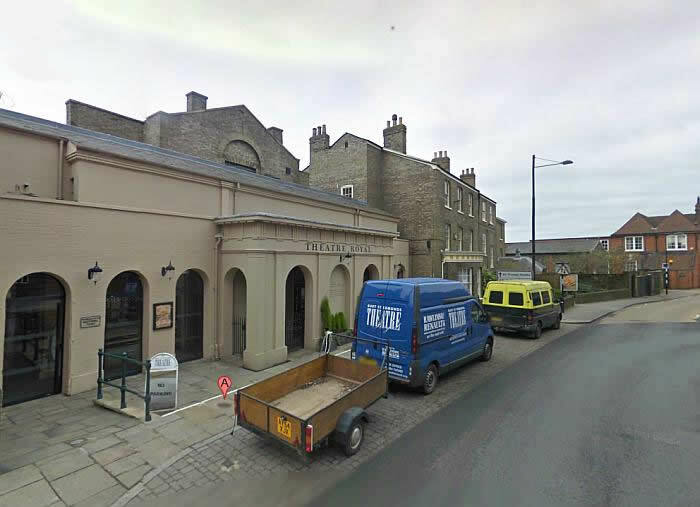 The Theatre is currently owned by Greene King Brewery, and leased by them to The National Trust, who in turn has leased the Theatre to Bury St. Edmunds Theatre Management Ltd, who run the Theatre. It is Grade I Listed. The current renovations, begun in 2005, have gone back to the original Theatre as much as possible and it is now on four levels. Firstly the Pit, which is surrounded by a double horse shoe of Stage boxes. The lower tier having four rows of tip up seats. The Upper tier is supported on 16 slender cast iron pillars, below which the tier has 15 boxes with no pillars present to obscure the view. The auditorium walls are painted a deep salmon pink, and the upper tier of box fronts have gold and ochre painted sphinxes and griffins. The Ceiling has a clouded sky painted onto it. 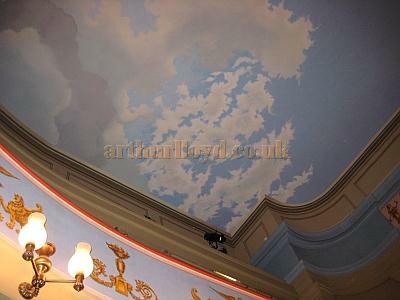 Right - The auditorium Ceiling of the Theatre Royal, Bury St. Edmunds in 2009 - Courtesy David Garratt. The proscenium is rectangular in shape, flanked on each side by pairs of marbled classical pillars with curved and panelled walls in which are Georgian proscenium doors leading onto the forestage. 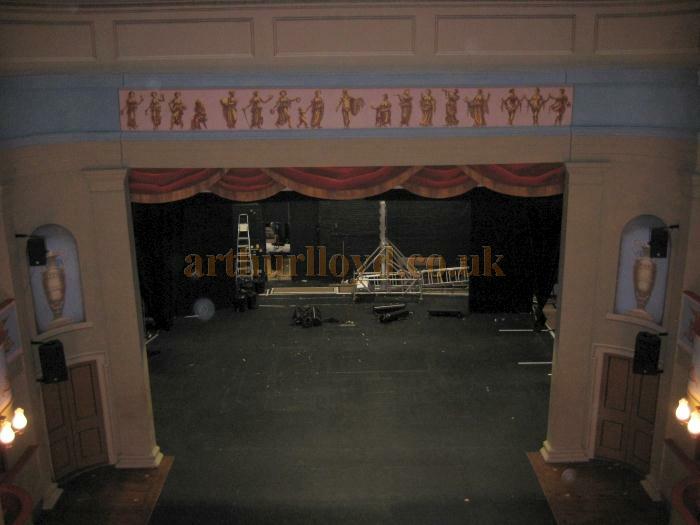 The Proscenium is 7.3 metres wide (24 feet) by 5.5metres high (18 feet). The forestage was resited to the line it was in 1819, and converts to an orchestra pit, capable of holding 25 musicians. The stage is 13.1 metres (43 feet) wide by 12.2 metres (40 feet) deep. The current stage was restored but in a flat state rather than the original raked stage floor. There is no Fly Tower, the scenery being suspended by a modern tubular structure (installed in 1965) which takes the load onto concrete pads in the basement under the stage. The height to the grid (to trusses) being 20 feet. 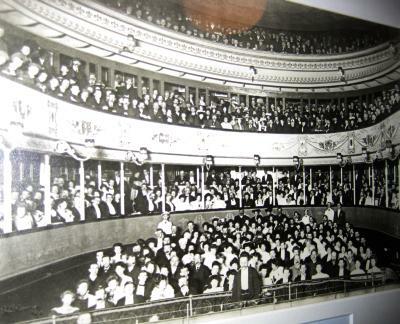 Left - The auditorium of the Theatre Royal, Bury St. Edmunds from a photograph which hangs in the Theatre's Foyer - Courtesy David Garratt. After 2 years of extensive renovations the Theatre Royal re-opened on the 11th September 2007 with the Melodrama of 1829, 'Black Eyed Susan' by Douglas Jerrold. The Theatre continues successfully to present a programme of plays, musicals, one night stands, and community productions. Each Christmas presenting its own Pantomime. It also has a policy of keeping the Regency plays alive, through productions and its 'Restoring the Repertoire', rehearsed readings series. The Theatre is elegant, cosy and intimate, currently seating 360 people on its various levels (originally holding 800 people). Well worth a visit, to experience as near as possible today, how a Regency Theatre looked, for its atmosphere, and how a Georgian Theatre worked. 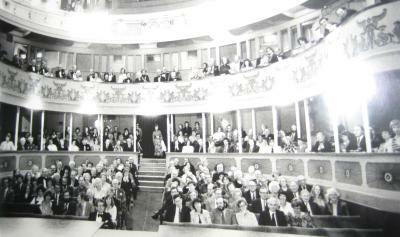 Right - The auditorium of the Theatre Royal, Bury St. Edmunds from a photograph which hangs in the Theatre's Foyer - Courtesy David Garratt. The above article on the Theatre Royal, Bury St. Edmunds was written for this site by David Garratt in March 2012 is © David Garratt 2012.